Editor’s note: This is the second in a series of stories about Joyce Kilmer-Slickrock Wilderness and old-growth forests in Western North Carolina. The Joyce Kilmer Memorial Forest will celebrate the 75th anniversary of its dedication with a rededication ceremony on Saturday, July 30. To read more about old growth forests in Western North Carolina, read the first installment in the series or a slide show from the forest. It’s easy to see why folks love the Joyce Kilmer-Slickrock Wilderness. Thousands of visitors are drawn each year to the sight of its majestic trees – enormous by East Coast standards – and the place boasts many of the characteristics of the ancient, primary forest that once covered the southern mountains. 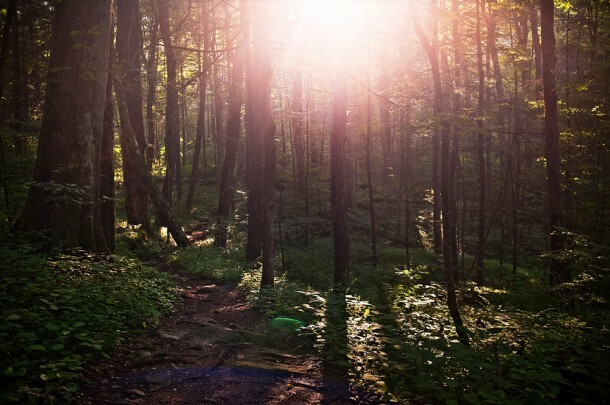 On Saturday, July 30, more will come to celebrate the 75th anniversary of the dedication of Joyce Kilmer Memorial Forest with an event including a Cherokee traditional Blessing of the Land, the reading of poetry and more. But on the eve of the area’s anniversary, it’s clear, too, that the recovery of these stands have faced real challenges. 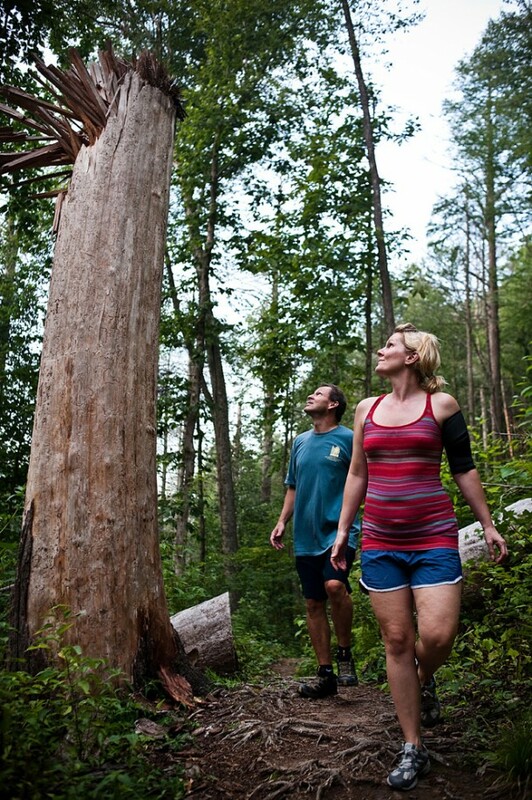 Among the most publicized is the woolly adelgid, but it’s not the only challenge facing the wilderness area, which is arguably the best-known and most-sought-out grouping of old growth in Western North Carolina. The hemlock woolly adelgid, which first arrived on Japanese nursery stock in the 1950s and appeared in the southern mountains around 2001, has killed many hemlocks in the area. A large number of standing, dead trees along the main trail in Joyce Kilmer, which were killed by the pests, were regarded by forest managers as a public safety hazard. But closing the trail was not a desirable option, as Joyce Kilmer receives some 40,000 visitors each year. Chainsaws are not allowed, as motorized equipment is excluded from designated wilderness by law. 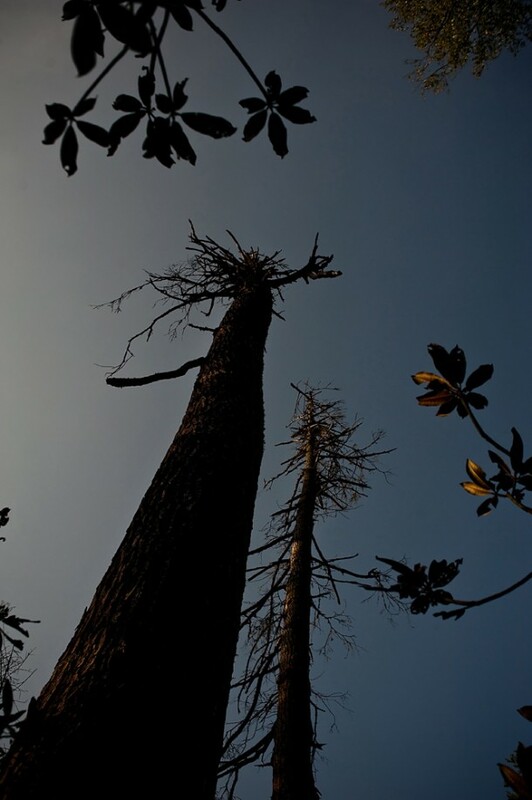 So the U.S. Forest Service elected to use dynamite to take down about 150 huge trees, using the reasoning that the exploded trunks would resemble natural snags left behind after a storm event. The sight of the snags is a bit of a shock to some visitors, especially those who knew Joyce Kilmer before the adelgid invaded. The trail leading to the Poplar Cove Loop, once cool and shaded by the big hemlocks, is now bathed in sunlight, the shredded trunks of the hemlocks standing like splintered sentries. Sunlight drenches the ground; the shade-loving trillium wildflowers are bleached from too much sun and the lush green moss is gone. Among visitors to Joyce Kilmer recently queried by CPP, reaction to the sight of the shredded trunks of the dynamited trees is mixed. Carla Brank came from Asheville recently for a week to fish in the stream alongside the parking lot with her family. While she admits she didn’t hike the trail once shaded by the big trees, Brank said she has faith in the agencies working to protect the resource. “Our grandchildren will be able to come here and fish,” she says. In contrast, Alene Arnold of Nashville, Tenn., who was hiking Joyce Kilmer’s loop trail with husband, Cris, was returning to Joyce Kilmer for the third time. “The minute we put our foot on the path, we were surprised” by the change in character of the place, she says. “We were just wondering if we should bring the kids,” who might be upset by the sight of the exploded trees, she says. Is Joyce Kilmer still old growth? Blozan feels the National Park Service behaved proactively in working to identify its best hemlock stands and inoculated them with a systemic insecticide before the pest struck. Those stands contain healthy trees today, he points out, thus serving as a living seed bank until a long-term solution to the adelgid is found. In contrast, the Forest Service’s Joyce Kilmer no longer qualifies as old growth, Blozan says. “The adelgid erased the naturalness, because it was a human-introduced insect,” he says, referencing a strict definition for identifying old growth as areas with no signs of human disturbance. But Pederson sees hope. “Life finds a way,” he says. “It’s fascinating. You can hit this planet with an asteroid, kill off all the top animals, change ecosystems for thousands of years, and yet this fuzzy little thing called a mammal pops up. Susan Andrew is contributing reporter for Carolina Public Press. Contact her at waterthrush@bellsouth.net. I hiked in Joyce Kilmer a few days ago for the first time in over a decade. The Forest Disservice should be ashamed of how they treated the forest. They caused what the military calls “collateral damage” by blasting adjacent trees. Standing snags take many years to fall down and in the interval become habitat for a huge number of species. Woodpeckers help the process of habitat enhancement. I hope the cretins who blew up Joyce Kilmer are prohibited from future government work.